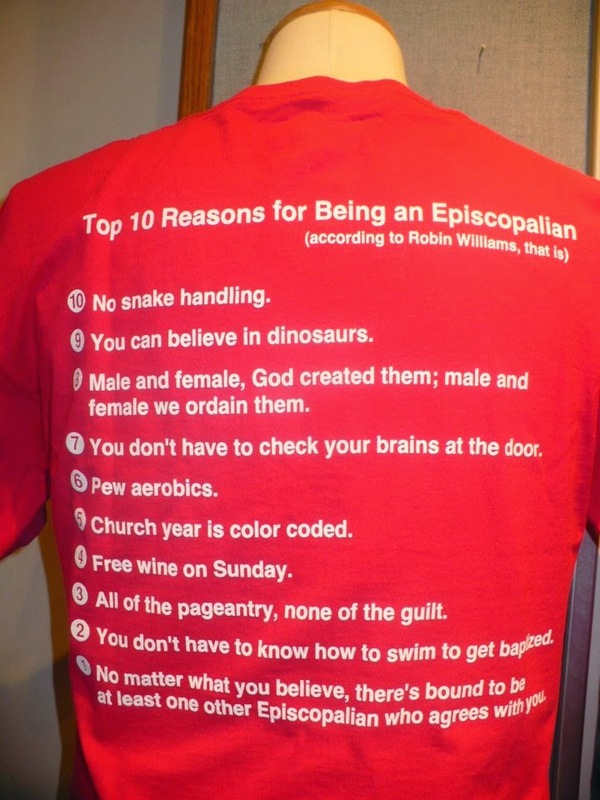 If you're an Episcopalian, you've likely encountered comedian Robin Williams' "Top Ten Reasons to be an Episcopalian." Evidently the former Mork & Mindy star is an Episcopalian and his list is absolutely brilliant. Who cares if no one I know has actually ever seen him worshipping at an Episcopal Church? His father was an Episcopalian and the actor/comedian was raised as one so that's good enough for me. First uttered as part of an HBO special, it has gone as viral as anything in the Episcopal Church. In fact, I'm wearing a bright red t-shirt with the Episcopal shield on the front and Williams' list on the back -- it's been a great conversation starter over the years. 3. All of the pageantry -- none of the guilt. It would be the ultimate act of hubris to update this iconic list but I'm on vacation right now and…what the heck? Humility is in the eye of the beholder -- I think that's in the Bible somewhere. 10. The only thing we take literally is "Coffee Hour." 9. All of the sacraments -- none of the indulgences. 8. Gay and straight God created them; gay and straight we marry them. 7. Bouncers don't check your ID at communion. 6. Fire and incense, not fire and brimstone. 5. Guilt-free royal watching -- because we're Anglicans. 4. Vestments cover a multitude of wardrobe malfunctions. 2. Washington National Cathedral? Yeah, that's ours. 1. We're the only ones God trusts enough to take the summer off. I now need a second t-shirt to go with the one I wear for all High Holy Days. Your list is as funny as Robin's! Remember there are a few "Hollywood types" that are Episcopalians! "Verily, I say unto you, wherever two or three are gathered together, they shall be joined by a fourth bearing a fifth." With the exception to the one about royals watching, list works for my Lutheran congregation as well. Nice list! Excuse my ignorance (and I ask this respectfully), but why does any of this make you better than anyone else? That is one to make the change and 19 to say it does not need to be changed! This is a good list. It certainly shows that Episcopalians/Anglicans can laugh at themselves. The list doesn't say they are better just 10 reasons to be one and the list (original 10) was made by a comedian... "It's a joke son, a joke"
How do I get a shirt? That one about taking the summer off almost makes me want to think about being religious again. Wait a minute – Episcopalians are not religious are they? Sounds a little soft for me. Where is the authenticity? I want a Church - with all its teeth. Not a club of believers who that bend to the desires of the time. *sigh* Dear Anonymous, Christians who can laugh at themselves are being humourous, not literal. At least, not completely literal. All right - literal but with a hefty pinch of salt, a lime wedge and some tequila. 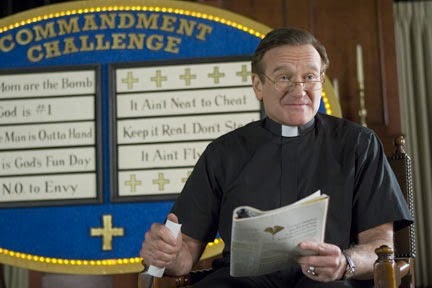 if God had not intended Christians to laugh He would not have created Robin Williams. I rest my case. What's with all the "Father" business? I thought that was the Roman church, after all. Let it go, already! Hey, you forgot "Mother". We Allow that too. One of them. Tolerance. That's the best reason to be Episcopalian. Followed immediately by the ability to laugh at ourselves right along with God. Amen! And of course the one thing that we can all absolutely agree on, in any Christian denomination, is that the minute anyone says anything about anything related to belief or practice it will start an argument. And, today Robin Williams died. May he rest in Peace. As a UMC pastor, I spent the better part of my life having never really spent a lot of time around Episcopalians. Until I went to seminary. Now, whenever I preside over communion, ask that God would bless the bread and wine, look down and see little cups of grape juice looking up at me, I always laugh inside, and feel like a dirty liar haha! Robin Williams - made us laugh...may he find peace and happiness in Heaven. Wearing my t-shirt today & sad. Anonymous, I am sorry you have missed the ability to laugh at one's self. Humor is God's way of allowing us to maintain sanity. Please feel free to believe whatever you wish but keep your judgements of others to yourself. This is only meant as a joke between people who understand the humor.